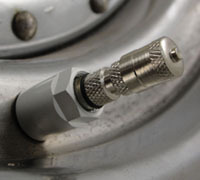 Most TPMS sensor failures are caused by galvanic corrosion of the valve core and stem. This sounds like an easy fix — but until now, service techs could not, in most cases, replace the valve stem without replacing the entire sensor module, rebalancing the wheel, and resetting the TPMS sensor. Proven reliable in thousands of miles of real-world, all-season testing, the Ken-Tool reCore Sensor Saver System changes all that. Simple -The Ken-Tool reCore kit provides everything you need to drill out the corroded valve core, tap new threads, and install a new, corrosion-proof valve core and stem. No need to have the TPMS computer re-learn the module. No need to even remove the tire or wheel from the vehicle! Fast - With a little skill, a tech can install a new valve stem in 10-15 minutes. Compare this to the time it takes to order a replacement TPMS module, install it, and reset the vehicle’s TPMS system. And that’s not to mention the cost savings you can pass on to the customer! Profitable - The Ken-Tool reCore TPMS Sensor Saver Kit will not only pay for itself after a few uses — it will provide you with great profit margins. And, since there are more than 200 million TPMS sensors on the road today, it opens the door to a high-potential market.